2013 Akira Seiki Performa SR2 XP CNC Vertical Machining Center s/n V05130136 w/ Akira Mi645 Controls, Hand Wheel, 20-Station Side Mounted ATC, CAT-40 Taper Spindle, 11,000 RPM, Chip Auger, USB Port, 15” x 27 ½” Table, Coolant. 2012 Akira Seiki Performa SL-35 CNC Turning Center s/n SL35120004 w/ Fanuc Series 0i-TB Controls,Hand Wheel, Tool Presetter, 4000 RPM, 12-Station Turret, Tailstock, 10” 3-Jaw Power Chuck, Collet Pad Nose, High Flow Coolant, Chip Conveyor, Fedek DH-65L Automatic Bar Loader / Feeder. 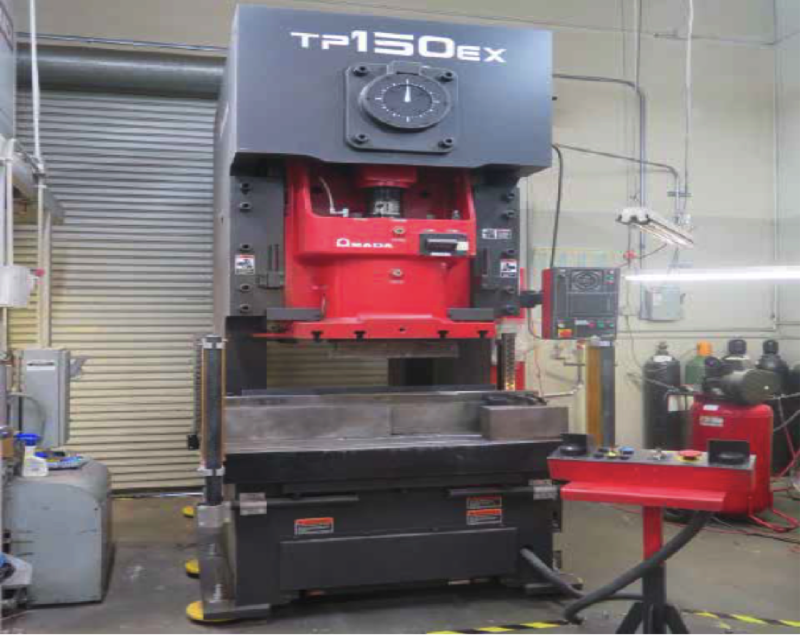 2008 Amada TP150EX 150 Metric Ton / 165 Short Ton Hydraulic Stamping Press s/n 76100436 w/Amada PLC Digital Controls, Pendant Controller, 8.86” Stroke, 3.94” Ram Adj., 23.25” Shut Height, 25-45 Strokes/Min, 27.56” x 21.65” Slide Area, 49.25” x 29.53” Bolster Area, Protech Eagle Eye Light Curtain. Minster 6 60 Ton OBS Fixed Base Stamping Press s/n 6SS-30142 w/ Minster Controls, 45-90 Strokes/Min, 6” Stroke, 14” Shut Height, 2.75” Slide Adj., Air Clutch, 32” x 21” Bolster Area, Minster mdl. 18T 18”Cushion w/ 4.00 Max Draw, Light Curtain. 2007 Benchmaster SGR28 28 Ton Fixed Base Hydraulic Stamping Press s/n 72581 w/ Ceico Press Control Package, 3.15” Stroke, 2” Ram Adj., 60-100 Strokes/Min, 9.8” Shut Height, 16” x 27 ½” Bolster Area, Protech Eagle Eye Light Curtain. Benchmaster / Peck-Lewis Stamping Press w/ Benchmaster III Press Clutch Control, 7” x 10” Bolster Area. 2006 Birmingham mdl. X6323A Vertical Mill s/n 064773 w/ UNIQ SDS2MS Programmable DRO, 3Hp Motor, 80-5440 RPM, 16-Speeds, R8 Spindle, Chrome Ways, Power Feed, 9” x 49” Table. Bridgeport Series 1 – 2Hp Vertical Mill s/n 199428 w/ Fagor Innova DRO, 60-4200 Dial Change RPM,Chrome Ways, Power “X” and “Y” Feeds, 9” x 42” Table. Induma Vertical Mill s/n 5745 w/ Newall Topaz Programmable DRO, 2Hp Motor, 80-2713 RPM, 8-Speeds, Power Feed, 9” x 42” Table. H.E.S. 16 16” x 72” Geared Head Gap Bed Lathe s/n 17580 w/ 36-1800 RPM, Inch/mm Threading, Tracer Template, Tailstock, Trava-Dial, SPI Tool Post, 10” 3-Jaw Chuck, Coolant. Pexto 12U52 12 GA x 52” Power Shear s/n 840046 w/ Manual Dial Back Gage, Front Supports. Enco mdl. 130-5110 6” x 6” Corner Notcher w/ Stand. 2011 May Tool mdl. MTC-42DV3/4 42” Power Circle Shear s/n 1878 w/ 0-350 RPM, Stand. DiAcro Brake No. 4 24” Hand Brake w/ Stand. DiAcro Shear No.1 6” Hand Shear. Famco No. 3 ½ R Arbor Press w/ Speed Wheel, Stand. General Pneumatics mdl. 6000CS Pneumatic C-Frame Insertion Press w/ 6 ½” Throat, Stand. Schmidt Precision Pin Press s/n 13RF-05-2012. Cress 2000 Deg. F Electric Furnace. DoAll mdl. 2012-1AC 20” Sliding Table Vertical Band Saw s/n 340-78398 w/ Blade welder, 50-5200 FPM,24” x 30 ¾” Miter Table. Kalamazoo mdl. 7AW 7” Horizontal Band Saw s/n 5548 w/ Manual Clamping, Work Stop. Boyar Schultz “Husk-E-Line” HR818 8” x 18” Surface Grinder w/Walker Fine-Line Electromagnetic Chuck,Wheel Dresser, Coolant. Sunnen mdl. MBB-1600 Precision Honing Machine s/n 41676 w/Coolant. Rockwell 2-Head Gang Drill Press w/ Rockwell mdl. 20 Variable Speed Heads, 125-1250 Dial RPM, 24” x 36” Table. Electro-Mechano mdl. 601J Variable Speed Bench Model Drill Press s/n 80347 w/ 150-4000 RPM, 14” x 19” Table. (2) Central Machinery Table Model Drill Presses. New Holland mdl. K-24 Chip Spinner. Palmgren 2” Pedestal Belt Sander. Burr King mdl. 562 1” Pedestal Belt Sander. Crane “Lapmaster 12” Lapping Machine w/ Compound Pump. Dayton and Central Machinery Pedestal Grinders and Buffers. 6” Belt / 9” Disc Sander w/ Stand. Carolina mdl. CBP1200 50 Ton Hydraulic H-Frame Press s/n 11600. (2) Ingersoll Rand T30 7.5Hp Vertical Air Compressors w/ 2-Stage Pumps, 80 Gallon Tanks. Husky 2Hp Portable Air Compressor w/ 30 Gallon Tank. Mr. Deburr Media Tumbler w/ 13” x 31” Tub. Huot “Super-Scoot” 40-Taper Tooling Cart. 5C Spin Fixtures and Collet Block Sets. Collet Chucks and Flex Collet Sets. Fagor Innova Programmable DRO w/ “X” and “Y” Scales (NEW). Sunnen Mandrels, Stones and Truing Sleeves. (4) Pneumatic Hardware Insertion Tools. Heli-Coil Insertion Tools and Inserts. Daniels Mfg. “Safe-T-Cable” mdl. DMC1001-712 Aerospace Safety Wire Wrapping Tool. 8” x 12” and 6” x 6” Sine Tables. Insert Mill Turning and Boring Tooling, Endmills, Drills Taps, Reamers and Abrasives. Kennedy and Waterloo Roll-A-Way Tool Boxes. Electro-Chem mdl. 200 Electrochemical Etcher. Brown &amp; Sharpe MicroVal CMM Machine s/n 072709 w/ Renishaw TP1S Probe Head, 22” x 29 ¾” Granite Table, Computer, Quadra-Chek IK5000 ver 3.1.1 Software. Enco mdl. NR Rockwell Hardness Tester s/n 88/947. Jones &amp; Lamson C-30L 30” Optical Comparator w/ 2017 Upgraded J&amp;J Metrology G1 Programmable DRO, 10X, 31.25X and 50X Lenses, 8” x 32” Table. Mitutoyo SJ-210 Digital Surface Roughness Gage. Microscan Bar Code Verification Scanner w/Kaiser RS1 Stand. Sunnen PG-800-S and PG-700-S Precision Bore Gages. Pratt &amp; Whitney Super Micrometer. Bausch &amp; Lomb Stereo Microscope. Mitutoyo Grade “A” Gage Block Set. Mitutoyo, DoAll and Import Gage Block Sets. Fowler Trimos 12” Height Master. Cadillac 12” Pla-Chek Height Gage. Mitutoyo 12” Height Master Riser. Standard Gage Dial Bore Gage Setting Master Gage. Mitutoyo 24” Digital Height Gage. SPI 12” Digital Height Gage. SPI 18” Dial Height Gage. (3) 18” and 12” Dial Height Gages. Webster mdl. B Hardness Tester. SPI 0-6” Digital OD Mic Set. Lufkin 0-12” OD Mic Set. Doosan PRO-5 mdl. G25E-5 4600 Lb Cap LPG Forklift s/n M8-00169 w/ 3-Stage Mast, 186” Lift Height, Side-Shift, Air Cooled Disc Brakes, Operator Sensing System, Solid Yard Tires, 167 Metered Hours. E-Z-Go mdl. 60 Electric Golf Cart s/n 916799. Presto mdl. M166 1000 Lb Cap. Hydraulic Die Lift. Kohler mdl. 15R58 15kW Backup Generator w/ 4-Cylinder Engine, 389 Hours. Ohaus CH11 Digital Counting Scale. Bananza Gas Fired Industrial Heater. Sheet Stock, Roll Stock and Bar Stock.